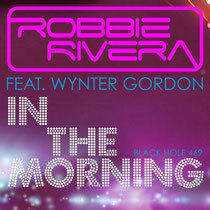 Robbie Rivera’s back with a brand new video for the “Juicy New York Remix” of his track ‘In The Morning’ featuring Wynter Gordon. Inspired by his July 15th Juicy New York event at Governors Beach (the first ever U.S. Juicy Beach event outside of Miami), this is intended to be the anthem for that moment when the club turns from dusk to dawn and you realize that you’re having the time of your life. Look out for a brand new package of ‘In The Morning’ remixes and other new Robbie Rivera tracks, which should be coming soon.